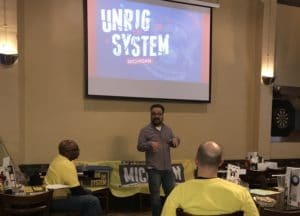 Attorney Joshua Covert speaks at Unrig The System at 4-15-18 in Lansing Michigan. On Sunday April 15th attorney Joshua Covert spoke at an event in Lansing geared to sharing information about local activism and grassroots efforts to empower citizens to play a larger role in the political process. 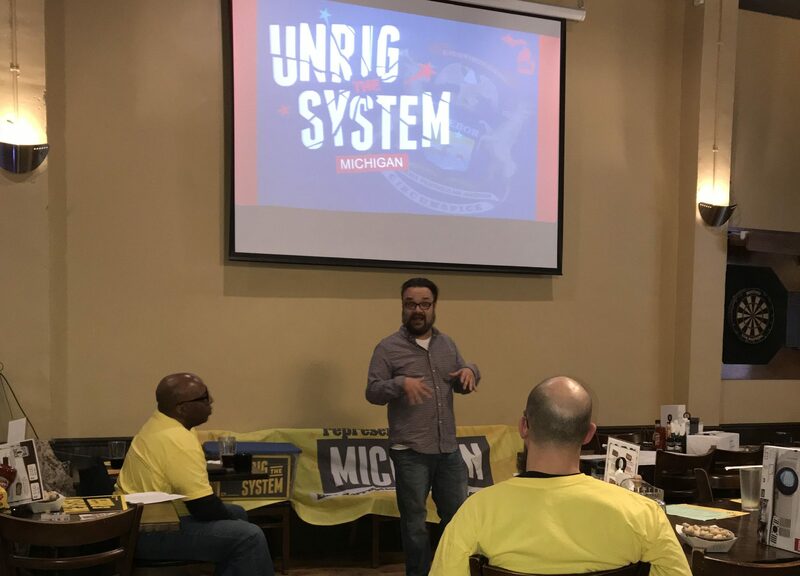 The event was put on by Unrig The System a nationwide organization with a chapter in Michigan (visit their facebook page here). Mr. Covert spoke as an attorney and activist involved in marijuana policy reform. Mr. Covert spoke about his work as a board member of milegalize, a 2016 voter initiative campaign, and how important the voter initiative process is for citizens. In an unpublished case, the Michigan Court of Appeals (People v Donaghy, No. 322677, 2015) interpreted the protections of section 4 of the Michigan Medical Marihuana Act (MMMA) in regards to the limitations of section 7(b)(4). The case involved an individual who was charged with what is commonly known as drugged marijuana driving, a violation of the motor vehicle code MCL 257.625 et. seq. The facts show that the defendant had tetrahydrocannabinol (THC), the active substance in marijuana as well as alprazolam (Xanax), methadone, and zolpidem (Ambien) in his system. The defendant at trial requested a jury instruction regarding his medical marihuana use and registry card as a defense to the operating while visibly impaired charge one of the two counts he was facing. The trial court denied the jury instruction request and the defendant appealed the conviction on many grounds. The Michigan Court of Appeals decided the case and said: “The MMMA’s protections are lost under § 7(b)(4) only when a person operates a vehicle “under the influence” of marijuana. This definition of “under the influence” is determined to be consistent with the phrase’s meaning as a term of art, operating a vehicle while visibility impaired under MCL 257.265(3) as a result of marijuana use, like operating a vehicle while any amount of marijuana is present in a person’s body under MCL 257.265(8), is too low of a threshold to deprive a person with protections under the MMMA that the person would otherwise be entitled to.” Unfortunately for the defendant, the ruling was not enough as the court upheld his conviction because the protections from a visibly impaired charge that the MMMA provides would not be relevant when the defendant also had the other controlled substances in his system. What does this mean for a medical marihuana patient who is arrested for operating while visibly impaired? The answer is DISMISSAL. If you are charged with any crime involving marijuana OR marijuana driving, call attorneys who present a defense and stay current on all the appeal cases.